Fortress Of Freedom Board :: View topic - FOF And Gritz Sign Recording Contract! FOF And Gritz Sign Recording Contract! 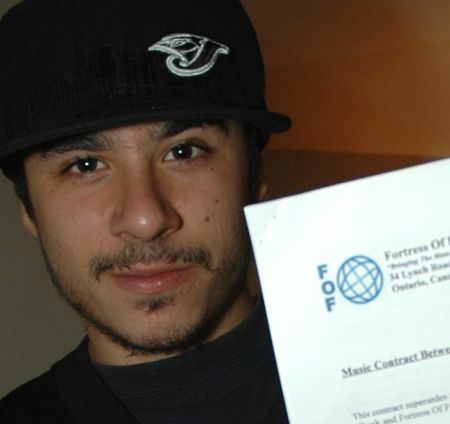 Posted: Sat Sep 30, 2006 4:46 pm Post subject: FOF And Gritz Sign Recording Contract! Maurice Ali and "Gritz" with a signed copy of the recording contract! The Fortress Of Freedom Corporation is pleased to announce that Jonathan Chuck ("Gritz") has signed a recording contract to produce a CD of several of his songs. Details are yet to be finalized, but the CD should enter the distribution stream with the bulk of FOF CDs to be launched in a little while. All of us at Fortress Of Freedom Inc. wish Mr. Chuck all the best in the production of this CD.